develops some really fun products from time to time. 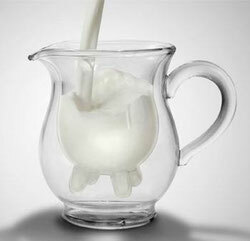 This Calf n' Half Creamer proves that milk pitchers can be udderly exciting! All website titles, designations, products, product names, and designs © 2018 DudaWerx, LLC. Unless authorized by you, the information you provide is confidential, proprietary, and will notbereproduced or sold in any manner by DudaWerx, LLC.